Les auteurs offrent une réflexion sur leur démarche intellectuelle dans le recours à des outils technologiques pour l’analyse textuelle sourtout dans le domaine des études littéraires. Voici quelques passages qui ont retenu mon attention. Par ailleurs, je cite deux autres livres à la toute fin de ce billet – ils concernent eux aussi le domaine (surtout le livre de Holsti, qui ne figure pas dans la bibliographie de Rockwell & Sinclair mais qui traite d’un sujet très proche). This book, to be clear, is not about what we can learn from corpus linguistics or computational linguistics. Rather, it is rooted in the traditions of computer-assisted text analysis in literary studies and other interpretive disciplines and the more hermeneutical ends of philosophy and history. It is about that tradition as much as it is about what you can do with hermeneutical things. Insofar as the tradition of literary text analysis has evolved in parallel with computational linguistics without building on it, we feel justified in leaving that for another project. En citant les travaux de Smith, Rockwell & Sinclair tentent de développer une approche théorique basée sur une approche itérative de l’interrogation d’un corpus (p.86-7). Smith a précédé Rockwell & Sinclair de quelques décennies mais fut confronté à la même problématique qu’eux: comment développer une approche méthodologique face à la montagne de données, statistiques, mesures, et autres calculs possibles sur un corpos précis. 1. Integritas: First, the aesthetic image (visual, audible, or literate) is encountered in its wholeness as set off from the rest of the visible universe. 2. Consonantia: Then one apprehends the harmony of the whole and the parts. These three phases or this aesthetic encounter make a pattern that we can use for the interpretive encounter. The sequence might be something like the following steps, the first two having been outlined in chapter 2 and the third covering how results are returned to you (the subject of this chapter). Demarcation First, one has to identify and demarcate the text (or corpus) one is going to interpret. In that choice one is defining the boundary of a work or collection from the rest for the purposes of interpretation. Pragmatically this takes the form of choosing a digital text and preparing it for study. Analysis Second, one breaks the whole into parts and studies how those parts contribute to the form of the whole. Smith, in “Computer Criticism,” suggests that this is where the computer can assist in interpretation. Stephen Dedalus summarizes this as analyzing “according to its form.” 18 The computer can automate the analysis of a text into smaller units (tokens). Even individual words can be identified and be used as the unit for analysis. of the work being studied. That is the synthesis into visualizations and then into an essay; a new work that attempts to clarify the interpreted work. These syntheses are hermeneutica. When we return later to theorize computer-assisted interpretation, we will look more closely at Smith’s structuralist critical theory, the weakest part of his triptych of illustrative essay, theory, and tools. Smith , J. B. Image and imagery in Joyce’s Portrait: A computer-assisted analysis . In Directions in Literary Criticism: Contemporary Approaches to Literature, ed. S. Weintraub and P. Young . University Park : Pennsylvania State University Press , 1973 . Smith , J. B. 1978 . Computer criticism. Style 12 ( 4 ): 326 – 356 . Smith , J. B. 1984 . A new environment for literary analysis. Perspectives in Computing 4 ( 2/3 ): 20 – 31 . Smith , J. B. 1985 . Arras User’s Manual. TextLab Report TR85-036, Department of Computer Science, University of North Carolina, Chapel Hill. From samples to comprehensive data In the humanities and the social sciences, traditionally we either focus on works that are considered distinctive or sample larger phenomena. Big data draws on relatively complete datasets, often created for entirely different purposes, and uses them for new research. These datasets are comprehensive in a way that sampling isn’t, and in a way that can change the types of questions asked and can change people’s confidence in the answers. From purposeful data to messy and repurposed data Traditionally, the data used in research are carefully gathered and curated for that research. With big data, we repurpose messy data from other sources that weren’t structured for research and we aggregate data from multiple sources. This raises ethical issues when people’s information is used for purposes they didn’t consent to; it also means that we can extract novel insights from old data, which is why preservation of data is important. From causation to correlation Big data typically can’t be used to prove causal links between phenomena the way experiments can. Instead, big data is used to show correlations. Big data is being pitched as an opportunity to reuse data to explore for new insights in the form of correlations. There are even techniques that can comb through datasets to identify all the statistically significant correlations that could be of research interest. 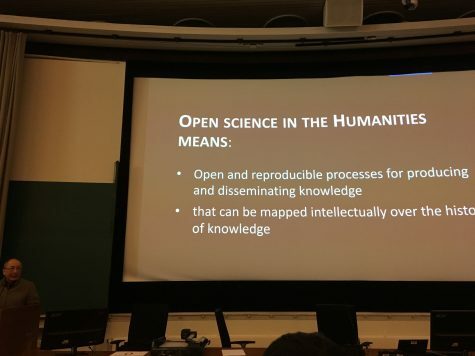 What Does This Mean for the Humanities? 1. Big Data changes the definition of knowledge. 2. Claims to objectivity and accuracy are misleading. 3. Bigger data are not always better data. 4. Taken out of context, Big Data loses its meaning. 5. Just because it is accessible does not make it ethical. 6. Limited access to Big Data creates new digital divides. modeling. We create models of systems and learn through the iterative making and reflecting on the models—especially when they fail, as they usually do. The false positives that our hermeneutica throw up tell us about the limitations of our models and hence about the limitations of the theories of knowledge on which they are based. What Can We Do with Big Data Analytics? At this point, let us take a quick tour through some of the opportunities and risks for Big Data in the Digital Humanities. Filtering and subsetting We begin with a basic operation comparable to what intelligence services do with Information in Motion: filtering big data to get useful subsets that can then be studied by other, possibly traditional techniques (e.g., reading). The Cornell Web Lab, which alas was closed in 2011, was working with the Internet Archive to build a system that would enable social scientists (and humanists) to extract subsets from the archive. The dearth of resources that allow for navigation between large databases of content (among them the Gutenberg Project of digital texts) to specialized environments for reading and analysis should be noted here. Enrichment “Enrichment” is a general term for adding value. In the context of big data, researchers are developing ways to enrich large corpora automatically using the knowledge in big data. In “What Do You Do with a Million Books?” (the 2006 article that first prompted many of us to begin thinking about what big data meant in the humanities), Greg Crane wrote eloquently about what we now can do to enrich big data to make it more useful. Crane has made the further point that simply providing translation enrichment could provide us with a platform for a dialogue among civilizations. Sequence alignment Sequence alignment can be adapted from bioinformatics for the purpose of following passages through time. This is the research equivalent to what plagiarism detectors do with students’ papers. They look at sequences of text to see whether similar passages can be found in other texts, contemporary or not. Horton, Olsen, and Roe (2010) described work they had done with the ARTFL textbase to track how passages in an influential twentieth-century history by Paul Hazard had been cribbed from a seventeenth-century text. The point is not that Hazard was a lazy note taker, but that one can follow the expression of ideas across writers when one has them in digital form. the Trésor de la langue française (TLF) and the Thesaurus Linguae Grecae (TLG) projects, diachronic analysis got a lot of attention after Google made its Ngram Viewer available and after Jean-Baptiste Michel and colleagues published their paper “On Quantitative Analysis of Culture Using Millions of Digitized Books” (2010). There are dangers to using Ngrams (or phrases of words) to follow ideas when the very words have changed in meaning, orthography, and use over time, but the Ngram Viewer is nonetheless a powerful tool for testing change in language over time (and its search-and-graph approach makes it accessible to a broad public). Classification and clustering Classification and clustering comprise a large family of techniques that go under various names and can be used to explore data. Classification and clustering techniques typically workon large collections of documents and allow us to automatically classify the genre of a work or to ask the computer to generate clusters according to specific features and see if they correspond to existing classifications. A related technique, Topic Modeling, identifies clusters of words that could be the major “topics” (distinctive terms that co-occur) of a large collection. An example was given in the previous chapter, where we used correspondence analysis to identify clusters of key words and years in the Humanist archives. now possible to extract named entity data automatically from large text collections, as the Voyant tool called RezoViz does. Jockers , M. L. 2013 . Macroanalysis: Digital Methods and Literary History. Urbana : University of Illinois Press . Moretti , F. 2007 . Graphs, Maps, Trees: Abstract Models for Literary History. London : Verso . Moretti , F. 2013 b. Network theory, plot analysis . In Moretti, Distant Reading . London : Verso . L’analyse de données massives et textuelles amène certains écueils. A second problem with analysis of big data is the dependence on correlation. It doesn’t tell you about what causes what; it tells you only what correlates with what (Mayer-Schönberger and Cukier 2013, chapter 4). With enough data one can get spurious correlations, as there is always something that has the same statistical profile as the phenomenon you are studying. This is the machine equivalent to apophenia, the human tendency to see patterns everywhere, which is akin to what Umberto Eco explores in Interpretation and Overinterpretation (1992). The dependence on correlations has interesting implications. In 2008, Chris Anderson, the editor in chief of Wired, announced “the end of theory,” by which he meant the end of scientific theory. He argued that with lots of data we don’t have to start with a theory and then gather data to test it. We can now use statistical techniques to explore data for correlations with which to explain the world without theory. Proving causation through the scientific method is now being surpassed by exploratory practices that make big science seem a lot more like the humanities. 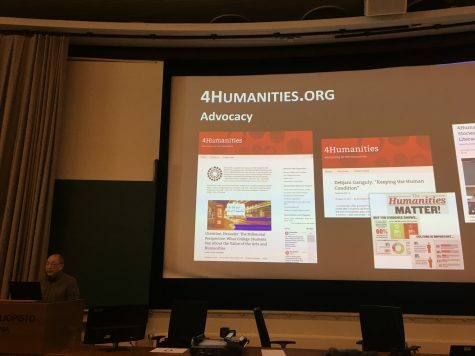 It remains to be seen how big data might change theorizing in the humanities. Could lots of exploratory results overwhelm or trivialize theory? What new theories are needed for working with lots of data? A related problem is “model drift” or “concept drift,” which is what happens when the data change but the analytical model doesn’t. […] The fact that people’s use of language changes over time is a major problem for humanities projects that use historical data. People don’t use certain words today the same way they used those words in the past, and that’s a problem for text (p. 133) mining that depends on words. If you are modeling concepts over time, the change in language has to be accounted for in the model—an accounting that raises a variety of interpretive questions. Does a phrase that you are tracking have the same meaning it had in the past, or has its meaning evolved? Eco , U. 1992 . Interpretation and Overinterpretation. Cambridge University Press . analysis is expensive not so much in terms of computing (of which there is an ample supply thanks to high-performance computing initiatives) as in terms of the human effort required to do it well. Is computational analysis worth the training, the negotiating of resources, and the programming it requires? Individuals at Voyant workshops ask this question in various ways. Also important are the disciplinary discussions taking place in departments and faculties that are deciding whether to hire in the Digital Humanities and whether to run courses in analytics. Hermeneutica can help those departments and faculties to “kick the tires” of text analysis as a pragmatic way of testing analytical methods in general. Les auteurs offrent un exemple de leur cru des écueils de l’analyse de données massives et textuelles. idea for a Conjecturator (Juola and Bernola 2009) so that it could run on one of the University of Alberta’s HPC machines. The Conjecturator is a data-mining tool that can generate a nearly infinite number of conjectures about a big dataset and then test them to see if they are statistically interesting. Les auteurs indiquent que cette approche, lorsqu’appliquée au corpus de tous les livres publiés en 1850 génère plus de 87000 affirmations positives!! Ils pointent vers la fin de la théorisation scientifique classique (p. 132 – citant Chris Anderson qui, en 2008, a annoncé la fin de la théorisation scientifique). Donc, quoi faire avec 87000 théories? • Many of the results are trivial. They may be statistically valid, but many nonetheless are uninteresting to humans. • Many of the results are related. You might find that there is a set of related assertions about shirts over many decades. These are some of the first theoretical reflections on text analysis by a developer. Though they aren’t the earliest such reflections, Busa’s ideas and his project are generally considered major initial influences in DH. 10 His essay positioned concordances as tools for uncovering and recovering the meanings of words in their original contexts. Busa is in a philological tradition that prizes the recovery of the historical context of language. To interpret (p. 153) a text, one must reconstitute the conceptual system of its author and its author’s context independent of the text. A concordance refocuses the philological reader on the language. It structures a different type of reading: one in which a reader can see how a term is used across a writer’s works, rather than following the narrative or logic of an individual work. A concordance breaks the train of thought; it is an instrument for seeing the text differently. One looks across texts rather then through a text. The instrument, by its very nature, rearranges the text by showing and hiding (showing occurrences of key words and their context grouped together and hiding the text in its original sequence) so as to support a different reading. Busa , R. 1980 . The annals of humanities computing: The Index Thomisticus. Computers and the Humanities 14 ( 2 ): 83 – 90 . Tasman , P. 1957 Literary data processing. IBM Journal of Research and Development 1 ( 3 ): 249 – 256 . Smith reminds us that the term “computer criticism” is potentially misleading, insofar as the human interpreter, not the computer, does the criticism. Smith insists that “the computer is simply amplifying the critic’s powers of perception and recall in concert with conventional perspectives.” [Smith 1978, p327] It would be more accurate to call his theory one of “computer-assisted criticism,” in a tradition of thinking of the computer as extending hermeneutical abilities. According to Smith, “the full implications of regarding the literary work as a sequence of signs, as a material object, that is “waiting” to be characterized by external models or systems, have to be realized.” [ibid] The core of Smith’s theory, however, comes from an insight into the particular materiality of the electronic text. As we pointed out in chapter 2, computers see a text not as a book with a binding, pages, ink marks, and coffee stains, but as a sequence of characters. The electronic text is a formalization of an idea about what the text is, and that formalization translates one material form into another. It is just another edition in a history of productions and consumption of editions. structures we want to fit to the text. In “Computer Criticism” (1978) and “A New Environment for Literary Analysis” (1984) Smith talks about following a “fire” theme; in “Image and Imagery in Joyce’s Portrait” (1973) he gives an example of how he studies such thematic structures. Smith describes a mental model of the text as vertical layers or columns. Imagine all the words in the text as the leftmost base column, with one word per line. Then imagine a column that marks which words belong to the fire theme. That layer could be plotted horizontally in a distribution graph. If one has a number of these structural columns, then one can also study the co-occurrence of themes across rows. Do certain themes appear in the same paragraphs, for example? In the late 1970s, Smith was trying to find visual models that could be woven into research practices. He called some of his methods Computer Generated Analogues of Mental Structure (CGAMS), drawing our attention to how he was trying to think through the cognitive practices of literary study that might be enabled by the computer. Like Perry’s model railroad, CGAMS provide a model theory that has explanatory and scalable power. The visualizations model a text in a way that can be explored, and they act as examples that a computer-assisted critic can use to model his or her own interpretations. That the computer forces one to formally define any text and any method makes this structuralist understanding of interpretation even more attractive as a way of understanding computer-assisted criticism. Les auteurs (p. 162) proposent que deux classes de théories sont pertinentes dans les humanités numériques: les instruments et les modèles. Masterman , M. 1962 . The intellect’s new eye . In Freeing the Mind: Articles and Letters from the Times Literary Supplement during March–June, 1962 . London : Times . Thus, the things of the Digital Humanities are all models that are formalized interpretations of cultural objects. Even a process as apparently trivial as digitizing involves choices that foreground things that we formerly took for granted, forcing us to theorize at least to the point of being able to formalize. In order to be able to know what we are digitizing and how to do so, we need to develop a hermeneutical theory of things. Author Rockwell, Geoffrey, 1959- author. Title Hermeneutica : computer-assisted interpretation in the humanities / Geoffrey Rockwell and Stéfan Sinclair. Description viii, 246 pages : illustrations ; 24 cm. Bibliography Includes bibliographical references (pages -239) and index. Contents Introduction: Correcting method — The measured words : how computers analyze texts — From the concordance to ubiquitous analytics — First interlude: The swallow flies swiftly through : an analysis of Humanist — There’s a toy in my essay : problems with the rhetoric of text analysis — Second interlude: Now analyze that! : comparing the discourse on race — False positives : opportunities and dangers in big text analysis — Third interlude: Name games : analyzing game studies — A model theory : thinking-through hermeneutical things — Final interlude: The artifice of dialogue : thinking-through scepticism in Hume’s dialogues — Conclusion: Agile hermeneutics and the conversation of the humanities. Scope and content « With increasing interest being shown in participatory research models, whether it be Wikipedia, World of Warcraft, participatory writing (like Montfort et al’s 10 Print or Laurel et al’s Design Research) or the more traditional communal research cultures of the arts collective or engineering lab, the Humanities is increasingly relying on computational tools to do the ‘heavy lifting’ necessary to process all of this information. 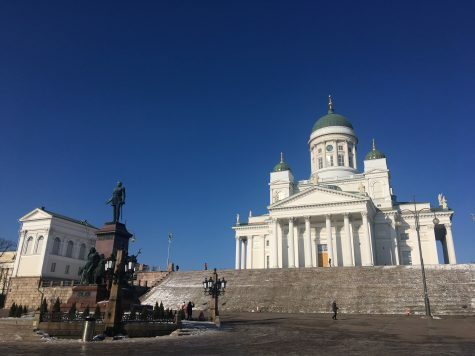 Hermeneuti.ca, as its name implies, is about hermeneutical things–the computing tools of research that are usually hidden–how to use them, and how they are interpretative objects to be understood. Hermeneuti.ca is both a book and also a web site (http://hermeneuti.ca) that shows the interactive text analysis tools woven into the book. Essentially, Hermeneuti.ca is both a text about computer-assisted methods and a collection of analytical tools called Voyant (http://voyant-tools.org) that instantiate the authors ideas. 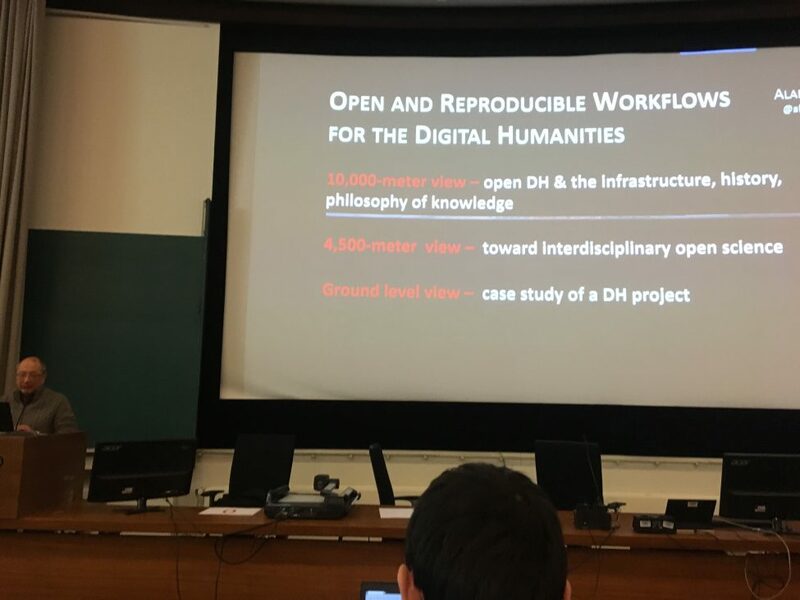 While there is a definitely an emphasis on classic Digital Humanities work (corpus analysis, information retrieval, etc. ), there is also a focus on the development of software as part of a project of knowledge that encompasses the idea of software as an active part of knowledge production that brings this book into the Software Studies series »–Provided by publisher. Subject Heading Humanities — Research. Alternate Author Sinclair, Stéfan, author. Title Memory machines : the evolution of hypertext / Belinda Barnet ; with a foreword by Stuart Moulthrop. Publication London : Anthem Press, 2013. Description xxvi, 166 pages ; 24 cm. Series Anthem scholarship in the digital age. Anthem scholarship in the digital age. Contents Foreword: To Mandelbrot in Heaven / Stuart Moulthrop — Technical Evolution — Memex as an Image of Potentiality — Augmenting the Intellect : NLS — The Magical Place of Literary Memory : Xanadu — Seeing and Making Connections : HES and FRESS — Machine-Enhanced (Re)minding : Development of Storyspace. Subject Heading Hypertext systems — History. Description 235 p. ; 22 cm. Content analysis (Communication) — Data processing.